It is with great sadness that we report the death shortly before Christmas of Peterborough Lion John Clarkson. He leaves a wife (a fellow Lion), two daughters and three sons. Lion John was a very active member of the club, and heavily involved in some of our most important fundraising events – including the Christmas Carol Float, making his death in the days leading up to the last weekend before Christmas all the more poignant. The funeral will be held at 2:30pm on Wednesday 7th January at the Church of St. John The Baptist in Werrington. Family flowers only. Santa and his helpers will be out at various supermarkets during the build up to Christmas. Members of Peterborough Lions will be busy helping out and would all love to see you. We would like to wish you all a very Happy Christmas and a Happy New Year. Thank you for all your support during 2014. 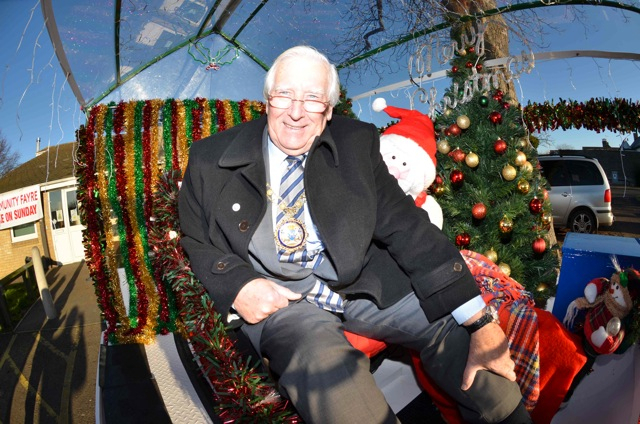 Peterborough Mayor, Councillor George Simons, joins Peterborough Lions at the Eye Community Centre Christmas Bazaar on 2nd December 2012. Thank you to everyone who came to see us there! 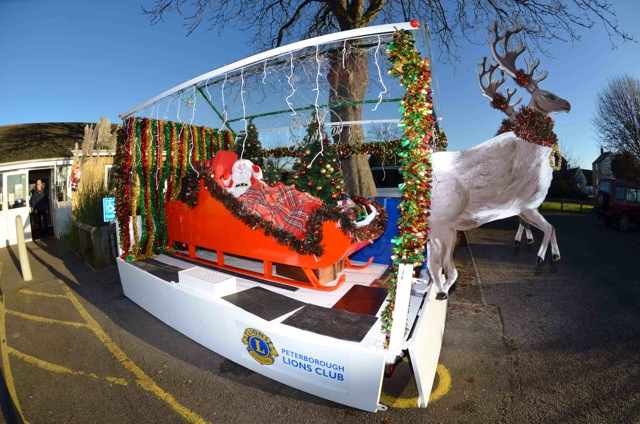 All the Peterborough Lions would like to thank the people of Peterborough and surrounding areas for your support over the past year, and for your donations, whether you saw us with Santa and his Carol Float in the past weeks, or bought a quiz leaflet, or any of the other ways we’ve been supported in 2011. Rest assured all the money raised will be put to good uses (if it hasn’t already! ), and be just as assured our fundraising efforts will be back in the New Year to provide resources for welfare and projects in 2012. We hope you have a great Christmas! See you soon! 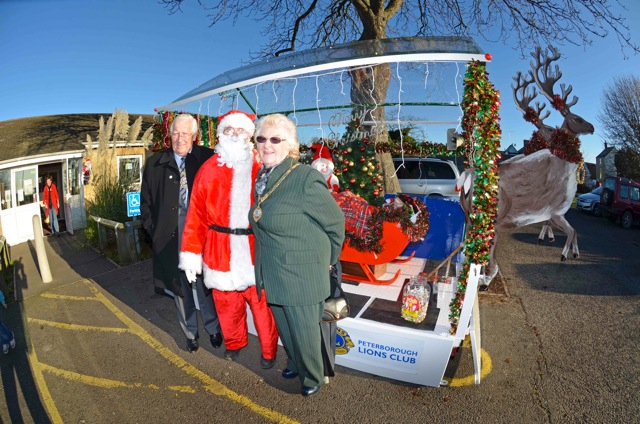 All being well, Peterborough Lions carol float will be making an extra stop at Dobbies garden centre in Hampton, on the evening of Thursday 15th December – although the weather forecast is making it less than certain! If you can brave the weather, come and see us! We’d like to thank Dobbies and all the other Peterborough stores who have allowed us to take up some valuable space outside their stores at this busy time of year. The dates for selling the Peterborough Lions Quiz Leaflets and for the Carol Float have been provisionally agreed and added to the calendar. More details on both the quiz and carol float to follow…..